Atheneum Books for Young Readers, 9781416949305, 160pp. Once a troublemaker, always a troublemaker? There’s a folder in Principal Kelling’s office that’s as thick as a phonebook and it’s growing daily. It’s filled with the incident reports of every time Clayton Hensley broke the rules. There’s the minor stuff like running in the hallways and not being where he was suppose to be when he was supposed to be there. 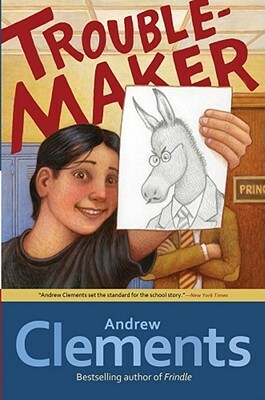 But then there are also reports that show Clay’s own brand of troublemaking, like the most recent addition: the art teacher has said that the class should spend the period drawing anything they want and Clay decides to be extra “creative” and draw a spot-on portrait of Principal Kellings…as a donkey. It’s a pretty funny joke, but really, Clay is coming to realize that the biggest joke of all may be on him. When his big brother, Mitchell, gets in some serious trouble, Clay decides to change his own mischief making ways…but he can’t seem to shake his reputation as a troublemaker. From the master of the school story comes a book about the fine line between good-humored mischief and dangerous behavior and how everyday choices can close or open doors. Andrew Clements is the author of the enormously popular Frindle. More than 10 million copies of his books have been sold, and he has been nominated for a multitude of state awards, including two Christopher Awards and an Edgar Award. His popular works include About Average, Troublemaker, Extra Credit, Lost and Found, No Talking, Room One, Lunch Money, and more. He is also the author of the Benjamin Pratt & the Keepers of the School series. He lives with his wife in Maine and has four grown children. Visit him at AndrewClements.com. Mark Elliott has a BFA in illustration from the School of Visual Arts. He has illustrated a number of book covers, and his work has been exhibited at the Society of Illustrators and the Art Directors Guild. Mark lives on a sheep farm in the Hudson Valley region of New York.